This striking, genuine, silver Ruby bracelet looks rich and exotic, and is perfect for adding colour to any outfit or occasion. 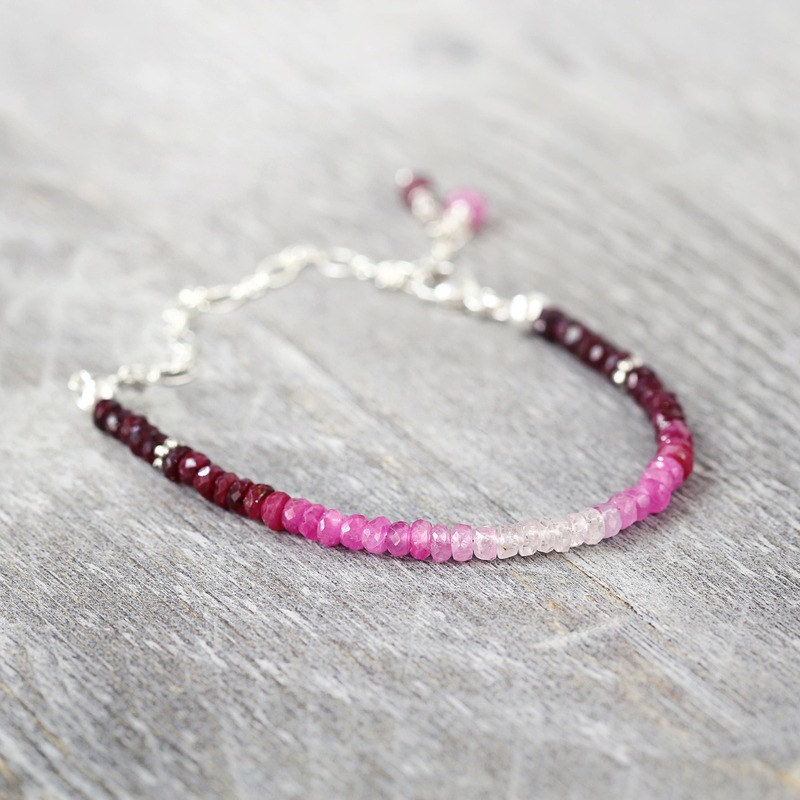 Featuring gorgeous, AAA, hand-cut Rubies which have been carefully chosen and strung in a striking 'ombre' effect. The graduated shading ranges from the palest, prettiest pink at the centre, through to rich ruby red & fuschia pink, and outwards to the deepest darkest red. These beautiful Rubies are excellent quality, and at approx 3 - 4mm they are larger, more even and plump than most Rubies on the market. Rubies are difficult to find in this quality at this size. Adjustable in length, it closes with a lobster clasp. 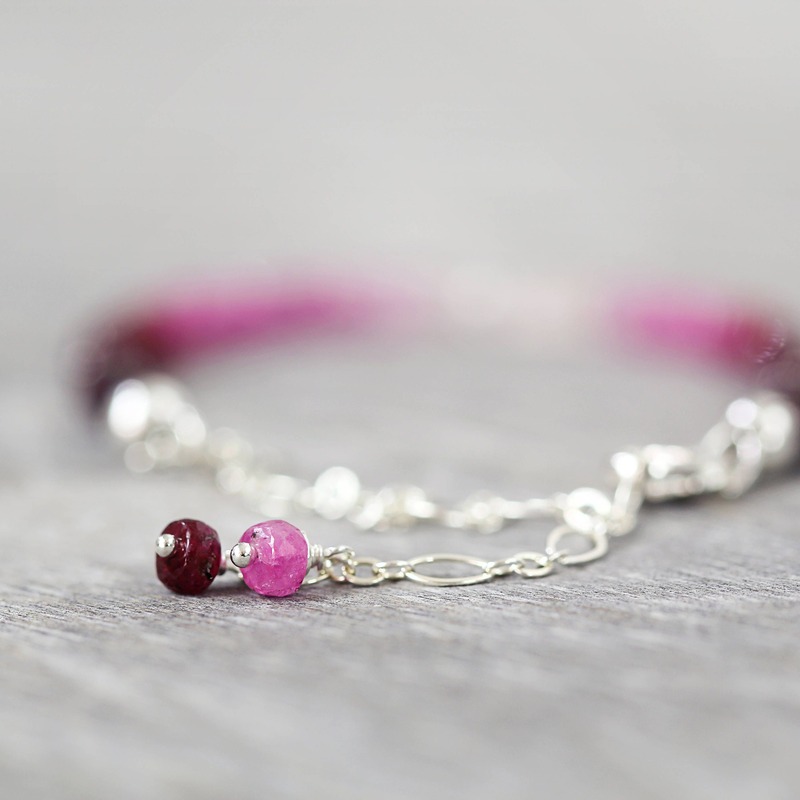 Finished with two Ruby charms that dangle beautifully on the inside of the wrist. It is beautiful worn alone or stacked. Rubies are the birthstone for July and the 40th wedding anniversary. 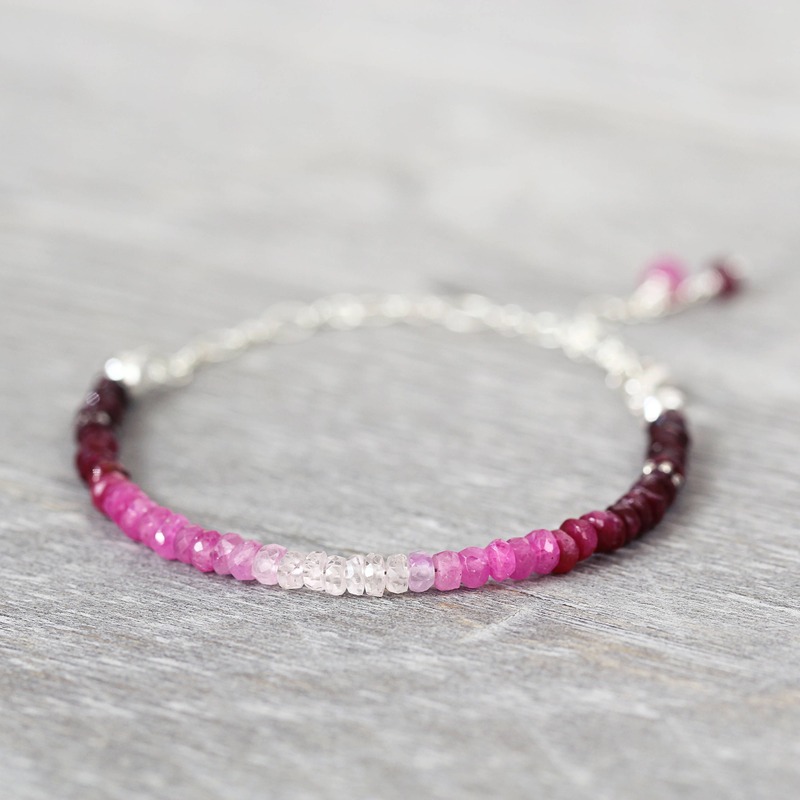 Ruby jewelry makes a perfect romantic gift for a loved one, whether for a birthday, anniversary or Valentine's Day, as Rubies have always been associated with love and passion. In fact, throughout history, Rubies were considered to be perfect wedding stones. Regarded by Hindus as the 'king of gems', the Ruby is considered to be the rarest and most valuable of all gemstones, and its value can exceeded even that of the Diamond. The Chinese Emperor Kublai Khan was said to have offered an entire city in exchange for a single Ruby! 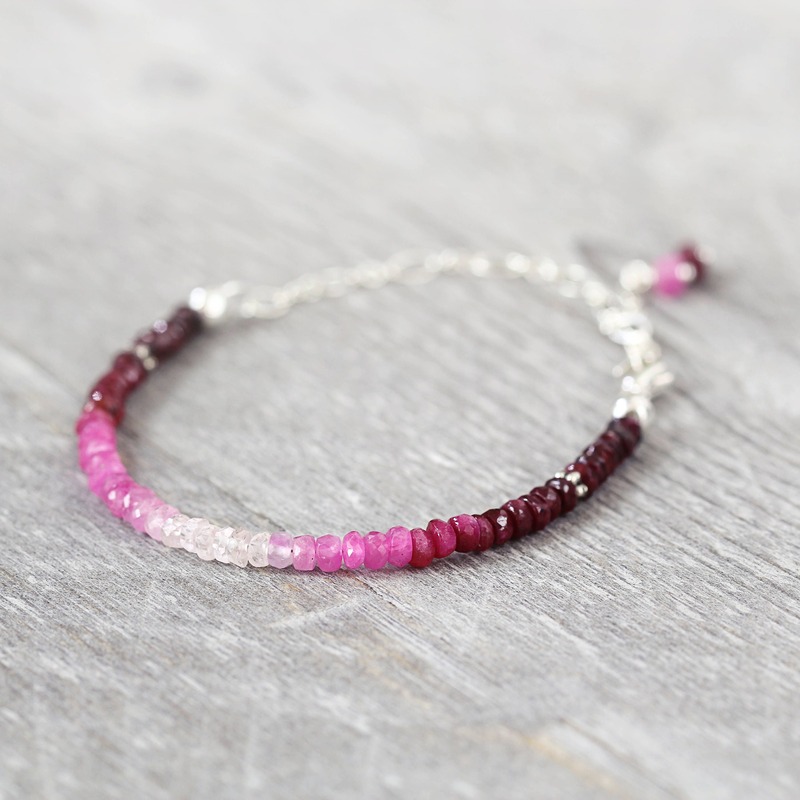 Worn alone or layered with others, this beaded Ruby bracelet will bring you colour and confidence. It makes a gorgeous gift for a loved one - for mum, sister, girlfriend, wife or a friend - for any occasion such as a birthday, a graduation, an anniversary or Valentines Day gift. 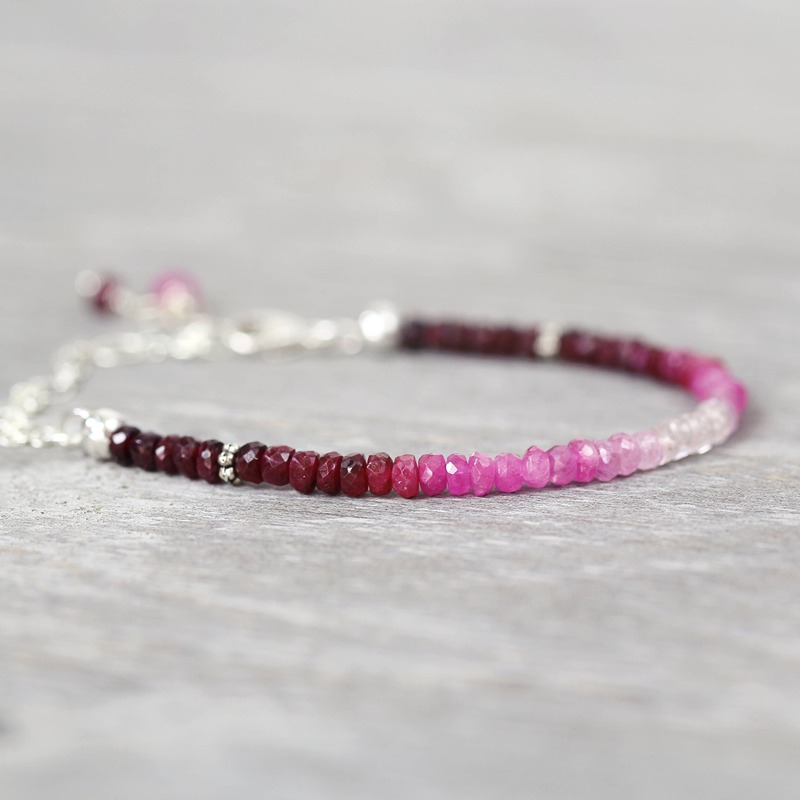 * Ruby beads measure approx 3-4mm. * Beaded section measures approx 4 inches.